The Green Power Juicer, Model KPE-1304, is the latest, lightest and most compact in this award-winning range of twin gear juicers. To promote and preserve your vitality and energy try this exceptional Green Power Juicer today for healthy living and longevity! The Green Power Juicer produces juice from Wheatgrass, Barley Grass and Other Leafy Greens, in addition to Fruits and Vegetables. The Green Power produces continuous juicing without stopping to remove pulp. The revolutionary new design of twin gears, screen component, release lever, feeding chute cover incorporates contemporarily designed main body which has more attractive looking. It has remarkably changed and each function has much improved in technology. 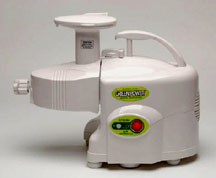 The patented twin gear impeller press system with the unique triturating twin gear features that powerfully rotates a low 160 rpm, the most Ideal speed, generates almost no heat, thus it prevents to destruct the nutrients and enzymes in the fruits, vegetables while juicing. The Green Power twin gears contain magnetic and bio-c eramic material that produce far infrared wave which called, the safest and most beneficial energy source. This magnetic process extracts a greater percentage of mineral nutrients from the produce by helping to add more positive ions and vitality and longevity to minerals in the juice. Pulp Outlet Pressure Controlled by Adjusting Knob which lets you control how much pulp you want. The pulp adjustment is easily controlled while you are juicing. From the outside of machine, you can control the pressure inside the juicer while your using the machine. Stainless Steel locking mechanism provides greater strength than the plastic knob of old models of twin gears. Magnets are located in the base of the juice bowl. This magnetic technology reinforce the effect to delay oxidation thus, it keeps the freshness of juice longer up to 72 hours. The Green Power Juicer will juice almost anything from vegetables and fruits to wheatgrass and pine needles. It is not limited to just regular juicing but you can enjoy a variety of other delicious foods such as nut butters, purees, baby foods, desserts, frozen fruit sorbet and pastas. Whisper Quiet Operation under 60 dB noise level. The quietest juicer in the market. Powerful 1/4 horsepower motor with precision engineering coupled with special reduction gears, reducing the speed to 160 rpm generates very little noise. A thermal protection device and anti-jam reverse action offer safe use and peace of mind. The automatic motor thermostat prevents the motor from overheating. Blockages can easily be cleared with the reverse action switch. New! Now included is a DVD to give you a quick visual reference before you start juicing with the Green Power 1304 for the first time. Toggle Switch - Waterproof switch with ON - OFF and REVERSE Positions.